OPM STANDARD form 50 is a U.S. Office of Personnel Management form also known as the "Notification Of Personnel Action". 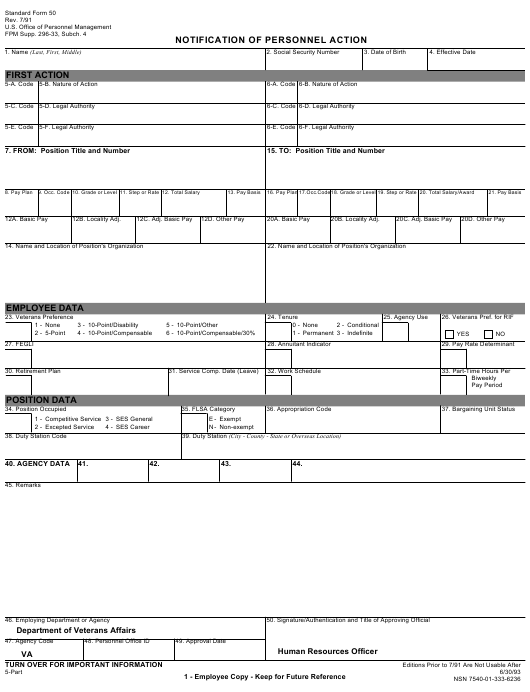 The latest edition of the form was released in July 1, 1991 and is available for digital filing. Download an up-to-date fillable OPM STANDARD Form 50 in PDF-format down below or look it up on the U.S. Office of Personnel Management Forms website. to make employment, pay, and qualifications decisions about you in the future. Blocks 5-B and 6-B describe the personnel action(s) that occurred. Blocks 15-22 show the position and organization to which you are assigned. creditable civilian and military service. pay period; and those with 15 or more years earn 8 hours each pay period. rate at which you earn leave and your current unused leave balance. other forms of premium pay. Your work Schedule is established by your supervisor. lower grade, or reassignment, and is used for pay retention purposes. prearranged scheduled tour of duty and works when needed. beginning in 1994, your locality-based comparability payment. when they are in pay status. should be available fo review in your personnel office. Service, the Excepted Service, or the Senior Executive Service (SES). Indicates whetehr you have preference for reduction-in-force purposes. reemployment if you have Federal service. Labor Standards Act); nonexempt employees are covered. Identifies the city, county, and state or the overseas location, where you actually work. your supervisor or your personnel office. forms, contact your personnel specialist. Federal Personnel Manuals Supplement 292-1.
immediately if there is an error in it.